Need a Hotel located just ouside of the main Exeter rail station? The Exeter St Davids Station Premier Inn Hotel is probably, if travelling or visiting Exeter by rail, one of the most conveniently located hotels in Exeter. St Davids Premier, with its 102 bedrooms was built and opened in March 2011 in a position adjacent to the main arrivals and departures entrance of St Davids railway station. With just the car park and road between the two, it really could not get any easier getting to your accommodation than this - get off the train, walk out the station and the Premier is in full view - no taxis or transport required. No waiting around or getting directions - just cross the road and rest! You can use this Quick Check search facility to find available accommodation for your dates or continue below to see more about the featured Hotel on this page. While the officially named 'Premier Inn Exeter Central St Davids' is in such a good position for an Exeter stop-off via rail, it does not find itself centrally located as well as the name suggests. 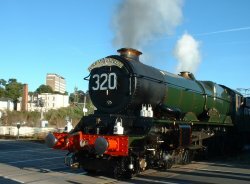 The hotel is located near Exeter's main station - Exeter St Davids not to be confused with Exeter Central Station. However, the Premier is only a 10-15 minute partly uphill-walk or a short bus ride from the city centre. The bus stop again being conveniently located outside the train station. There is no parking available at the hotel, but chargeable parking is available nearby. If your stay in Exeter is for longer than a few days, an Exeter local weekly Megarider ticket can be purchased (£14 November 2016) to overcome any location concerns. This can then be used for all bus travel in and around the city. Alternatively, a taxis rank is also suitably positioned across the road at the station. The convenience of the Premier Inn St Davids for walkers visiting the area is amplified by its locality and position for river walks in the area. The river Exe and Flood relief channel can be found nearby just over the other side of the railway crossing. 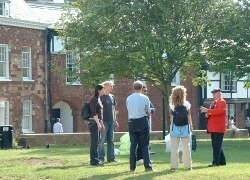 Exeter's historic Quayside and Riverside Valley Park with its wildlife haven can be reached by following the route downstream. The City provides an excellent choice of places to stay with a good selection of quality hotels and conveniently located b&bs and guest houses. 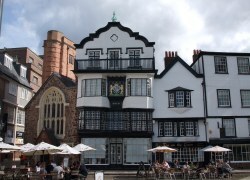 The Exeter accommodation featured on this page is just one of many that are available. To view more please visit Places to Stay in Exeter for details.